Student X, age 29, received two undergraduate degrees in two different fields of science. The first, a B.S. in Marine Biology from a small, private university, left her unable to find work in her field. After working at fast food restaurants and bakeries, Student X decided to go back to school and get another B.S., this time in Environmental Studies, from a large, public university. She now has a job in her new field. This chat-interview with keito is part of the March 2010 Higher Education issue of The Talking Twenties. Keito: It must not have been easy to leave Marine Biology…What finally spurred you to change fields and go back to school? Student X: I’m not really sure. I had a lot of influence from my family to keep looking for jobs other than slinging burgers. But I finally decided I would try graduate school and maybe teaching. Unfortunately, the public school, because they are so large, has the liberty of being very choosy and takes roughly 8 grad students into the program each year. That and my average from my undergraduate was about 0.02 short of their cut-off. They did send me a very nice letter saying they would have considered me…if I was one of their chosen eight! K: So a second bachelor’s was more accessible and could get better results for the money? X: Yes, definitely. And luckily, the majority of my previous classes were transferrable, so I finished a 4-year degree in about a year-and-a-half. K: How long was it in between your first graduation and your first Environmental Studies class? X: 2-3 years I think. K: What was it like being older than the typical undergrad and starting at a new school? X: Actually it wasn’t much of an age difference. There were a large number of people around my age in an undergraduate program at the public school, not just grad students. In fact, one of my first classes was with a former co-worker of mine. We had both worked at a donut/sandwich shop as bakers and used to trade stories about our lives up till then, since we had similar experiences. She had a Marine Science degree and also was unable to find work as anything other than a baker, and in the end she too went back and got another undergraduate degree at the same time I did. There were also quite a few students who were older than myself. I was just in the middle age group. The private school [where I got my first degree] didn’t have the returning ed groups. K: Were there lessons you learned in your first college experience that helped you do better with the second? X: Yes. I learned how to hound my professors when necessary and to fight the system and question the school if I felt something was wrong. Because of that, I had four more courses accepted as transfers than I would have otherwise 🙂 I learned the hard way at the private school, that not all professors and advisors have your best interest in mind. K: This is going to be one of those “if you knew then what you do now…” questions. If you could go back to age 17, when you were choosing which school to attend, would you make the same decision and get a second degree later, or would you go straight to your second degree that helped you find a job? X: That’s a very tough one. I made some wonderful friends and did have some incredible experiences at the first school, and I would certainly not be where I am today without that experience. And honestly, I really didn’t know that my current field existed at that time. I think maybe I would do it again, but smarter this time…but maybe not. K: lol! But that’s an interesting point — Environmental Science wasn’t popular at the time of your first degree, and I bet there weren’t nearly as many programs available then. Is it possible that your Biology degree had become outdated? There could be other students like you who could use a second Bachelor’s for the same reason. X: It’s quite possible. There’s a lot of overlap between the two. My marine biology degree was more about giving you knowledge, not applying it. The environmental studies degree was about knowledge and how to use it in practical ways, i.e. EMPLOYMENT. K: It’s also a growing field. X: I think a lot of Marine Biology jobs right now fall more under oceanography, and studying ecology of marine ecosystems. These are also majors available at schools today. Marine Biology I think is a little too vague now. It can cover just about everything without really focusing, or focusing too much on something to the point of no longer being useful. While the name says marine, it’s not only saltwater, but also freshwater environments that it includes. K: Most people picking their majors at college probably don’t think about how they can pick a degree in a field whose relevance will be lasting. Knowing what you know now, how would you advise they do that? X: If I knew that I would be making millions doing public speaking at schools! The environment, though, is a sure bet as far as having a growing trend. I think water will be very important in the future. Water system ecology, waste management, chemistry. I think you need to look at the current issues and trends over the last 10 years. That shows you what our problems are, and what the issues and needed jobs continue to be. That and truck driving. There is never a shortage of long-haul driver positions. K: True! I think this seems like a good place to end. Thank you so much for sitting down and taking the time to do this interview. It’s worthy of a two-parter. 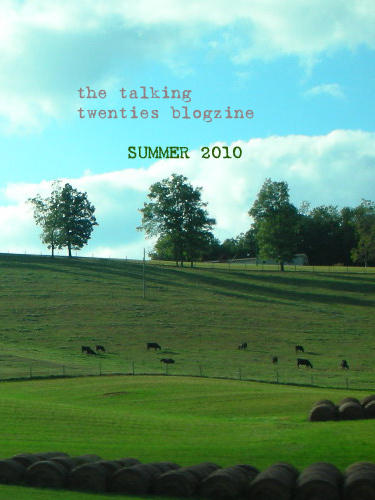 The Talking Twenties would like to Student X again for all her help and honest answers. To read Part 1 of the interview, click here.